This elegant high quality set is incorporated with a precision system. The professional grade mechanism allows to choose from 6 pre-set grind levels, select a fine grind for sauces and a coarser grind for intense flavour. Each grade mechanism has a 25-year guarantee. Presented in a Cole & Mason gift box. Exclusive design. Stainless steel. 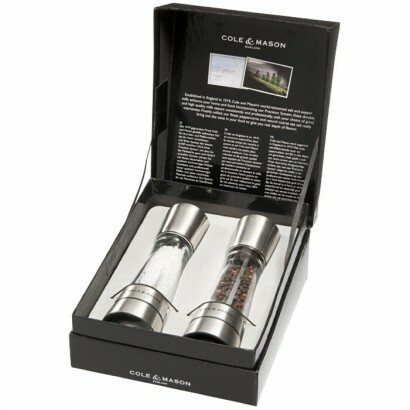 Salt and pepper mill set made of the finest sustainable beech. The pepper mill mechanism is made of hardened carbon steel and the salt mill mechanism is made of non-corrosive ceramic. Has a mechanism guarantee of 25 years. Presented in a Cole & Mason gift box. Exclusive design. Beech wood.